Does Judge Reveal Bias with Facebook Posting? [Milwaukee, Wisc] Does a Facebook posting and the subsequent comments to it reveal that the judicial deck in Milwaukee County is stacked against Governor Scott Walker? Misspelling of her name notwithstanding, the post seems to infer that Lt. Governor Kleefisch will be elevated to Governor at some point in the future when the Governor leaves office mid-term. Several of the Judge’s Facebook friends provided comments affirming their belief that the Governor will be charged as a result of the two-year John Doe probe currently being conducted by Democratic Milwaukee County District Attorney John Chisholm. The Landmark Legal Foundation has already called for an investigation of Cimpl and more than two dozen other judges for signing the petiton to recall Walker last year. The Gannett newspapers conducted an investigaton that uncovered the fact that 29 judges signed the petitions. Rick Esenberg, president and general counsel of the Wisconsin Institute for Law & Liberty, and former faculty member of the Marquette University Law School, said the post is troubling. 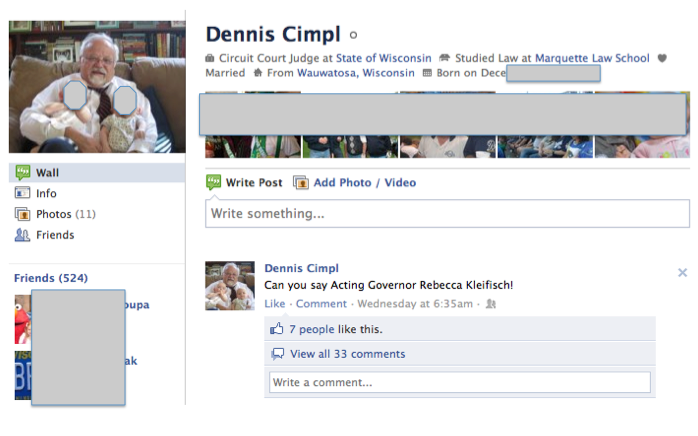 However, when reached for comment, Judge Cimpl said his Facebook posting was not improper. He laughed at the notion that the post had anything to do with the Doe probe. However, Esenberg’s assumption that the liberal judge’s comments pertained to the ongoing and supposedly secret John Doe proceedings were echoed by Cimpl’s friends. According to this LInkedIN profile, there is a Heidi Galvan who formerly served as an Assistant District Attorney in Milwaukee County and currently serves as an Assistant CIty Attorney for the City of Milwaukee. “I have no clue what’s going on in the John Doe investigation,” Cimpl insists. Clearly his friends, including many that appear to be in the judicial system with Judge Cimpl, assume (perhaps hope) he does. MacIver News Service will have more reaction to this story as it continues to develop.